When updating this web site, & you would like to be notified of the updates email Linda. Linda McGee is County Coordinator of the site, Linda is your host. She has joined IL Saving Graves, email group and has asked to do this county. So, everyone Welcome Linda McGee to Adams County, IL. @ IL Saving Graves County, Web Site. I will still be making the web pages for her but you will be seeing cemetery listings and tombstone photos from Linda in the near future. Thanks so much Linda for joining me in my quest to put this information online for others to enjoy and get some rewards from. I thank you everyone's ancestors thanks you also in enabling others to be able to or possibly be able to locate that special person they have been searching for. What People are saying about our web site!!!!!!!!!!!!!!!!!!!!!!!!!!! Linda, I was able to call Greenmount yesterday (couldn't bear to wait until Monday!). The lady there was very nice and she found the information very fast, thanks to you giving me the block and gravesite number. I should have asked her if she had any record of WHERE she died, but guess I was to excited over getting the other information to even think about it. 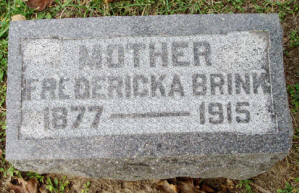 In 1930 census, she and Richard were living with their daughter, Marvel Alkire in Adams County. Marvel was head of the household at the time. Marvel married a ?? McLaughlin according to Richard's obituary. So it is possible that Marvel relocated after the second marriage and Lillian lived with her after the death of Richard. 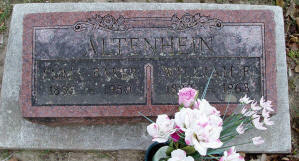 AND I also believe I found another HUBERT's children at Old Beverly Cemetary. Louis B Hubert is the father, JL & EA Hubert (parents of children who are buried at Old beverly is Louis oldest son and Charles L Hubert is another son. THANK YOU SO MUCH for making it possible for family to find family. To contribute your family's data, please & thanks click on emails below to contribute. We thank you & all of our Ancestors will thank you too. Linda called to my attention a couple of mistakes on here on the listings. 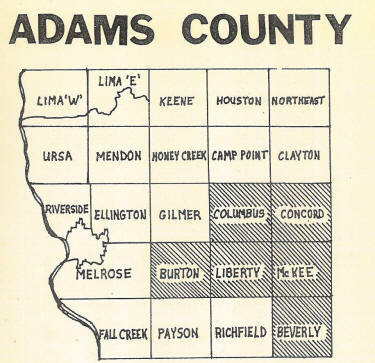 I originally got the listings from the IL Genealogical site online for all counties and this one for Adam's . The main ones that had changes to are high-lighted in white background. The county was established January 13, 1825 and named for President John Quincy Adams. John Wood is regarded as the founding father of Adams County. Wood and his friend, Willard Keyes, first settled in the area in 1819. The tombstone photos below were taken by Linda McGee. She then went home & used her Photoshop on the photos. On the left is the before -- on the right is the after photo-shop. She was so proud of her new found skill she had to share it with you. Beverly We couldn't find this one last summer. Concord No longer in use.. Could probably use some Help if it is still there. 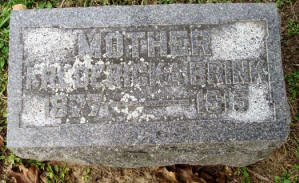 Listings of many people without tombstones; plus some they don't where buried. Rev. War Soldier buried here. Liberty Now w/tombstone photos with the listings. takes 9 m to download over slow net connect. cemetery needs some Tender loving care, with tombstones toppled over, under trees, falling over, some almost buried. Help Help Help!!! County Home Gilmer Linda says County Home was actually another cemetery in Gilmer township (different from Home alias Stahl), it was also known as the Adams County Poor Farm. It was bulldozed in the 60s. Keene Takes almost 10 m dwld ovr slw net connect. 181 tombstone photos. Have some tombstone photos of this cemetery. Only two people here in this cemetery. if you are related and have information on them email me so could put something more here. Thanks! Durbin Washington Grove McKee Abandoned & Destroyed. Fowler Chase-Evergreen Gilmer From Fowler, South on 96th St, to First road to the left, Follow road around curve to the cemetery. black & white photos takes 10m dwnld ovr slw net connect. This may no longer be evident as it was abandoned in 1984. Beverly Abandoned & not known if still there or not. 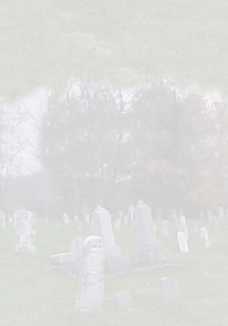 Liberty have tombstone photos, now all are online. Pearce Pierce Liberty Take Highway 104 east out of Liberty, go east on County Road 800N for 1 mi, turn right onto 2350E. Go about .8 mi from the intersection. uploaded tombstone photos Aug 15, 2006 By Linda McGee takes 7:54 min dowld over slw net connect. two pages. Gilmer Coming out of Quincy heading east go to St. Joseph road and make a right go down St. Joseph road and you will go about 5 miles before you reach the church on the right side of the road. McKee Have photos of the Church. we were close but I didn't know where the cemetery was. 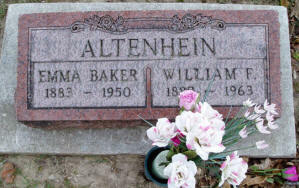 Disclaimer: These web pages here at IL Saving Graves, Adams County, IL Cemeteries, have no claim on any other Adams County, IL site nor they to mine, nor does the Adam County, IL, or any Society have any legal claim to these pages or it's information herein, nor any other web site with Adams co., IL Genealogy information on it. It is the sole property of Linda McGee, Foxie Hagerty & Kathy Mills. Not to be copied in any shape or form unless you have the written permission of the Authors of this site. Information on this site is not considered Public Domain. It is for the use of other fellow genealogists to help them in their quest in locating their ancestors last resting place & condition of such. Thanks for you kindness, consideration in this matter. Thanks!